A warm welcome is assured at this Saturday’s Tamahere Market whatever the weather. The mid-winter market has stocked up on seasonal clothing – hats, scarves, merino, socks – and will also have great hot food to keep the chill at bay. Saturday’s Tamahere Market promises plenty to brighten and warm the day. Winter’s fruity bright spots, mandarins, will be on sale along with other taste delights including honey, gourmet salami and wonderful stroopwafels. Now that the temperatures are dropping knitted beanies and scarves come into their own and become a must-have. The first Tamahere Market of the year is on this Saturday, kicking off the New Year with offerings including fresh, local sweetcorn, tote bags and skin products. “It is great when we have locals participating at the market by bringing along their fresh produce and unique products,” said market organiser Jane Manson. The January market promised to be laid back, especially in comparison with the rush of the pre-Christmas markets, she said. The last pre-Christmas Tamahere Market this Saturday is going all out to provide the extras for stockings and presents that are New Zealand-made. Stallholders have stocked up and are ready to go with – among many other offerings – art, crafts, sculpture, beautiful scents, polished rocks and stylish clothing. From 8.30am to 1pm there will also be the chance to nab award-winning cheeses along with salamis, avocados and fresh veges, plus free range eggs for the Pav. Tamahere’s special, annual Twilight Market is on this Saturday, December 2, 4pm, a perfect place to source NZ-made goodness for Christmas. “We have all manner of great ideas for presents as well as food – shoppers can eat dinner at the market – and we also have a special surprise,” said market organiser Jane Manson. The Tamahere Market this Saturday heralds a busy season of markets and events as the count down to Christmas begins. Among the usual wide and varied offering from stallholders this month will be orchid plants, magnesium products, vegetarian Indian food, quail eggs and hummus. As always the market is a great place to get New Zealand-made gifts and there will be several more opportunities to do so as well as get in the Christmas spirit in coming weeks. The Labour weekend Tamahere Market will be right on cue with plants for those gardens that are now demanding our attention. Heirloom tomato plants, dahlia tubers and calla lilies will be just some of the vegetation ready for planting. While we’re waiting for the bounty of our gardens, though, Saturday’s market will also be stocked with a large range of new season vegetables. 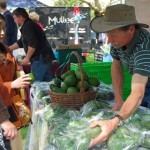 Avocados are making a welcome return to the Tamahere Market this Saturday, September 16. But take note keen avocado on toast smashers and guacamole makers: stock up while you can. “The avo season has been difficult due to low pollination so we are please to have them available,” said market organiser Jane Manson.